Belize NMS: A gusty southeasterly airflow continues to dominate our weather. 24-hour forecast: Sunny with cloudy spells today and partly cloudy skies tonight. Showers or thunderstorms will be genrally isolated. Winds: East - southeast 15-25 knots with occasional higher gusts. Today: Winds: E/SE 15-25 kts. With occnl higher gusts. ; seas: Rough. ; waves: 5-7 ft.; isolated showers or thunderstorms. Tomorrow: Winds: East 15-25 kts. ; seas: Rough. ; waves: 5-7 ft.; isolated showers. Marine Outlook: Sunday night:- winds: East 10-20 kts. ; seas: Moderate; waves: 4-6 ft.; a few showers or thunderstorms. 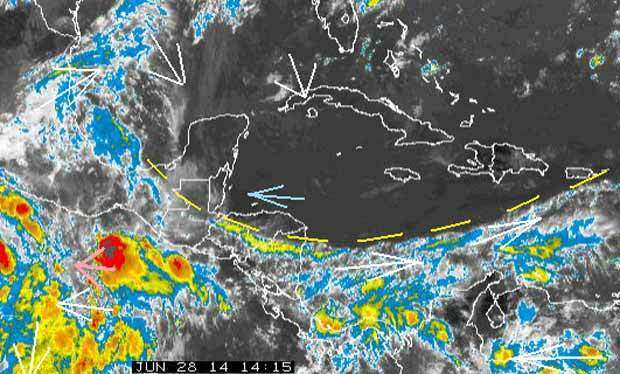 General Outlook: Through to Monday morning: Showers will increase along coastal areas. The closest tropical wave is currently at 82.7W and is slowing down as it approaches the eastern end of Honduras. The wind shear above the wave is very strong (the orange band) which is putting a lid on any convection. Therefore, I do not expect much in the way of rainfall from this wave, maybe only about 5 mm. 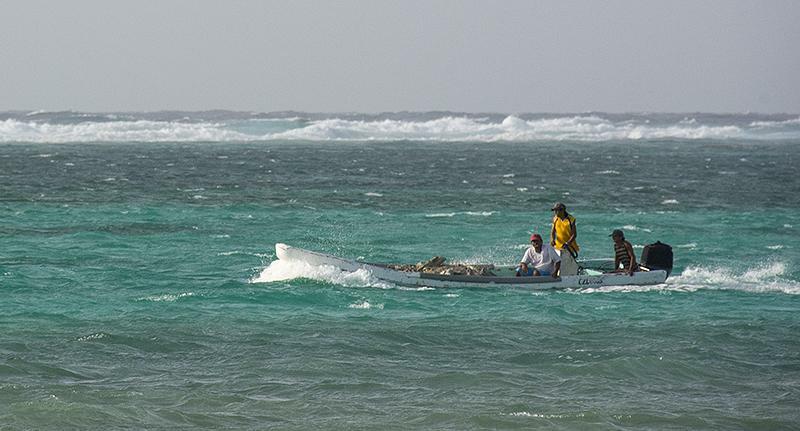 After a night of 17 mph winds the sea around Ambergris Caye this morning is rough but life goes on for the workers. The expected high is 89 and the sky is sunny. There is an odd sweeping line of cloud, now to the south of Belize, where the winds and cloud are moving rapidly Eastwards, leaving Belize and the northern Caribbean in clear, mainly dry weather.. . .. .There is thin, high cloud from North Mexico scattering our way at present. So I expect dry, mainly sunny with some scattered cloud today and probably tomorrow. 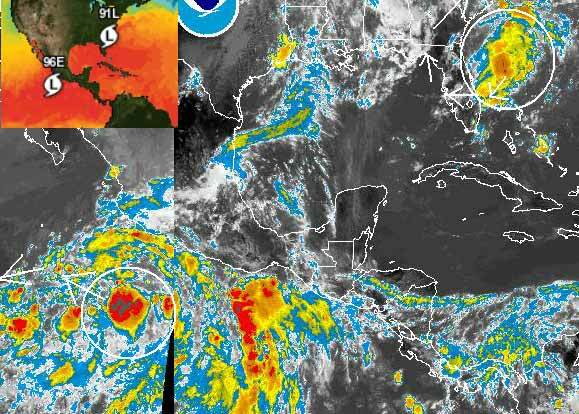 Two Tropical depressions out there. . . .Neither will effect us. . . . Although the Pacific one may well be having some effect on our dry weather. They think the one near Florida will turn tighter than I have shown though.